I don’t like New Year’s Resolutions mostly because I don’t like the inevitable failure and hopelessness caused by burdening myself with expecting huge immediate changes. And I know you don’t either. Because I’m can’t be the only one. One of the main reasons that we give up our well intentioned New Year’s resolutions is because we somehow think that a change of numbers in our calendar caused by another completed trip around the sun miraculously equates to a change in motivation that didn’t exist a few hours ago. Here’s the bad news. If you weren’t motivated to lose weight on December 31st, you’re not going to be motivated the next day. At least not long enough for it to last. Part of the reason for this is because we trick ourselves into believing that when we make resolutions that it’s the same as accomplishing them. If you decide that you are going to lose weight and share it with the world, you start to actually believe you have lost weight. You haven’t. It’s fun and easy to proclaim how much weight you are going to lose this year. Not so much when it comes to getting up at 5am to hit they gym before you go to work. You aren’t really motivated to do the work, you just want to experience the accomplishment. 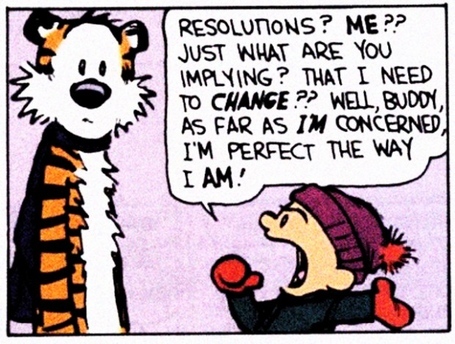 Which is the major problem with New Year’s resolutions. When we decide to make drastic changes in our lives; changes that are so sudden and unattainable just yesterday, then it’s inevitable that at some point we will fail. And that makes us feel bad about ourselves and that causes us to quit. I have a dream to write a book. But I know that if my resolution this year is to write a book then I will fail. Why? Because I struggle enough to write everyday as it is. So how the heck can I write a book? But more than that. Wrapped up in my dream to write a book are all sorts of insecurities about who I am and how people perceive me. The reason I really want to write a book is because I want people to hold me in high esteem and give me lovely compliments. But that’s a terrible and inevitably disastrous reason to write a book or do anything for that matter. So I haven’t made a resolution to write a book, because right now that is not within the realms of possibility. What is within the realms of possibility though is to write a little everyday. I can do that. It will more often than not turn out to be utter crap but when our perception of change is deconstructed then the crap is actually an important part of the process. Which leads to one final thought. Do we focus too much on the results rather than enjoying the process and when we do, does that put too much pressure on ourselves? If losing weight is the goal, a typical NYR that millions of us will make, that can hinder our motivation. But what if we decided to just enjoy the process. As I reached the end of my time at uni I really enjoyed my last set of exams for the first time in my life. The reason? Because I had stopped focusing on trying to get good grades but instead focused on enjoying the subject I was studying. I remembered that I chose Psychology because I was interested in it and while studying I realised one day I was interested in what I was learning. It fascinated me. Our education systems and societies are so bound up in standards and awards and who’s the best that we forget why we were doing this in the first place. So my final exams were fun. It wasn’t a hardship because the result wasn’t the goal. Discovering something fascinating and intriguing was and so when it came to the exam I wasn’t simply trying to remember stuff, I was getting to share something that I found amazing. The process is part of the fun. Messing up is part of change so embrace it. (Tweet this) Don’t let it squeeze the energy out of you because it’s not the end of the world. And most of all remember, change takes time. ← How should Christians respond when we’re “Attacked”?